About the Book: Condemned to death after she commits murder, Yelena is given an interesting opportunity. She can choose death or become the Commander of Ixia's food taster-and risk dying. Yelena chooses to be the new food taster. Valek, the chief of security, feeds her a poison called Butterfly's dust in order to keep Yelena from escaping and she must appear every morning for her antidote or she risks a slow and painful death from the poison. Yelena tries to plot an escape, while rebels plot a siege of Ixia and Yelena may hold a key to Ixia's future. GreenBeanTeenQueen Says: This book is the perfect example of why I love blogging and meeting other bloggers! I had seen so much love for this book around the blogosphere, I decided to give it a try-even though fantasy and I sometimes don't agree. I trusted my fellow book lovers and I'm glad I did. The story was inventive and I really liked Ms. Snyder's writing-it's very poetic. What I loved most about this book was the characters-they were vivid and real and I loved how the author kept you guessing on who was trustworthy and good. She keeps her readers on their toes! I also really liked Yelena-she's a very strong character and I really enjoyed reading about her. But Janco and Ari stole the book-I wish there would have been more with them. What I didn't like was the romance aspect. If you know me, you know I'm a romance junkie-I have to have it in my books. But the romance wasn't as developed as I would have liked. And I know a lot of readers who have read this book love Valek, but he just wasn't super crushworthy to me, which may have made the romance fail somewhat for me. I also would have liked more about Yelena as a food taster and that aspect to the story instead of the magic plot that got thrown in. Maybe it was because I listened to the audio, but once that started happening, I got lost and confused. (This might also be because I'm not typically a fantasy reader.) I listened to this one about a month ago, and there were parts of the plot I had to look up notes on because I couldn't remember-so there wasn't a lot of sticking with me long after I finished it. In some ways this book reminded me of Graceling, only not as hot as Katsa and Po. (Sorry Valek fans, but Po wins for me!) 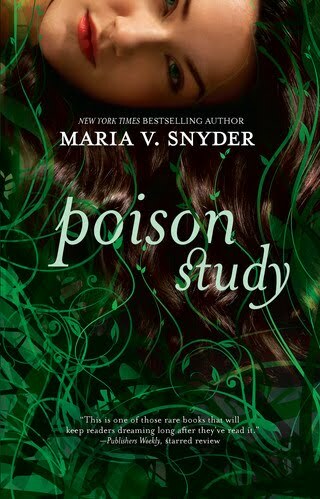 I think if you enjoy fantasy, Poison Study would be a book to pick up. I heard from a friend that the other two books aren't as good as this one, so if you've read the series, I'd love to know if I should keep reading or stop at book one. I recently read this book as well. I loved the premise of the book, but I also liked the magic aspect as well. (I'm a real sucker for fantasy). If you didn't like the magic aspect, you may not like the second book much. The poison testing has no role in the second book. I loved Poison Study and Janco and Ari were also my favorites. I also didn't really care much for Valek either. I didn't like the next 2 books as much as Poison Study. It was pretty much repetitive of the first book. Since you didn't really love this one then I don't think you'd like the others in the series. People who have read the entire series will stand by Valek..I agree in poison Study the romance isn't all that developed but in Magic Study you see them in better light..
Love this series! You might like her new book Inside Out. It has more of a SciFi bent to it. I'll be doing a revieew of it this week! Adriana-I keep hearing the next two aren't as good, so I'll probably put them off for awhile. Siriana-Love Po! He's so crushworthy! Karen-I'm interested in reading her new YA book-looks good. I'll look for your review. After loving INSIDE OUT, I'm totally willing to give this a try! I LOVE LOVE LOVE this author. She's one of my favorites. YABookNerd-I really liked her writing style, so I'd like to check out more of her books-and I'm glad she's writing YA! One of these days I'm going to get out to this book. I think I might like it. I just found your blog through Amanda's (A Patchwork of Books) and I'm loving it. I just read Storm Glass, her new series in that world and really enjoyed it. I'm becoming a fan of Maria Snyder so will read Poison Study. I'd recommend you read more of her books. A lot of bloggers like her. I love books with magic too! I also like audio books. I download them from the library web site and listen to them on my ipod on the treadmill. I haven't read this book yet but I have heard of it! I will check it out from the library! Hey, since todays the 28th, wHen will the winners of the Perfect Chem contest be announced? As for this book, omg I cant wait to read it! And I agree that the magic seemed a little tacked-on and the tasting was actually the more interesting aspect.